Our Med-Evac customers require specialized interiors that not only accommodate the needs of the crew, but offer a proactive approach to guard against corrosion, bacteria and fungus to help promote a sterile workplace in the sky. 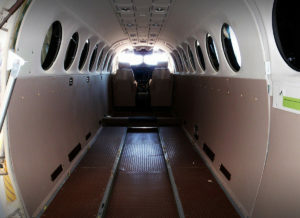 Due to the unique nature of the missions flown by Med-Evac crews, it is important to create a barrier that completely seals the entire cabin floor preventing liquids or other hazardous materials from breaching to the subfloor causing corrosion. Additionally, Luminary Med-Evac installations typically require the use of anti-microbial materials on all treated areas. 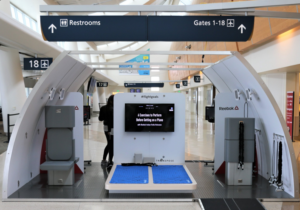 By utilizing the latest in bacteria and fungus killing floor treatment we can assist in providing a sterile and functional environment in any aircraft. In conjunction with our floor treatment, Luminary offers custom fitted sidewall panels for any layout that can accommodate all necessary medical equipment while increasing functionality. Custom interior panels can be manufactured from scratch for a custom Med-Evac interior or our engineering and program management can re-work existing panels to work with all necessary medical equipment. All panel treatment utilizes similar bacteria and fungus destroying technology. Seating for Med-Evac can be reworked or replaced with functional alternatives in conversion aircraft.